Christmas is pouring yourself a mug of hot chocolate to get rid of the cold. Christmas is finding the perfect branch on the tree for your favourite bauble. Christmas is watching the same movie as last year and the year before that but you don't care because it makes you feel at home. Christmas is spending hours in busy shops to try and find the perfect gift. Christmas is making sure your milk and cookies are perfect for when Santa arrives. Christmas is going to bed but staying awake to try and hear the reindeer's footsteps as they land on your roof. Christmas is seeing distant relatives for the first time since last year. Christmas is the sound of wrapping paper being ripped off hastily. Christmas is the feeling you get when you look around and realise that these people truly care about you. Christmas is the love, the laughs, the wonder, the joy. Who would have thought so much could fit into only one day? So, there you have the first poem I've ever shared on my blog before! I'd love to hear your thoughts down in the comments and please let me know if you'd like to see more content like this on my blog! As always my socials will be linked below and thank you so so so so so so so so much for reading. 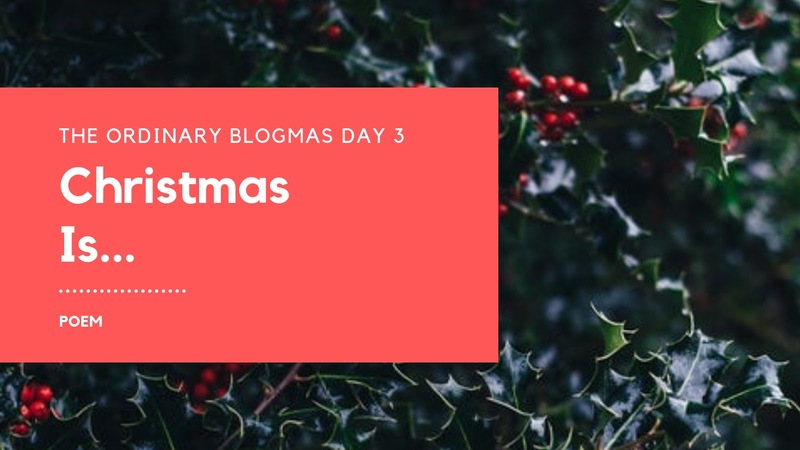 Merry blogmas!